After a slow start to the year, and with so much effort focussed on infrastructure rather than cultivation, it is good to see the harvest coming along nicely now. We have been enjoying beautiful creamy new potatoes, Sharpe’s Express and Red Duke of York, from the potato pots for some weeks. We steam these for best results, which prevents them from breaking up. The first of the outdoor potato beds is looking good now, and will be ready to supply new potatoes as soon as the pots are gone. The autumn sown onion sets are also developing nicely, with many of a good size already, and great used fresh. The outdoor sowings will provide the main crop for storage later in the year. 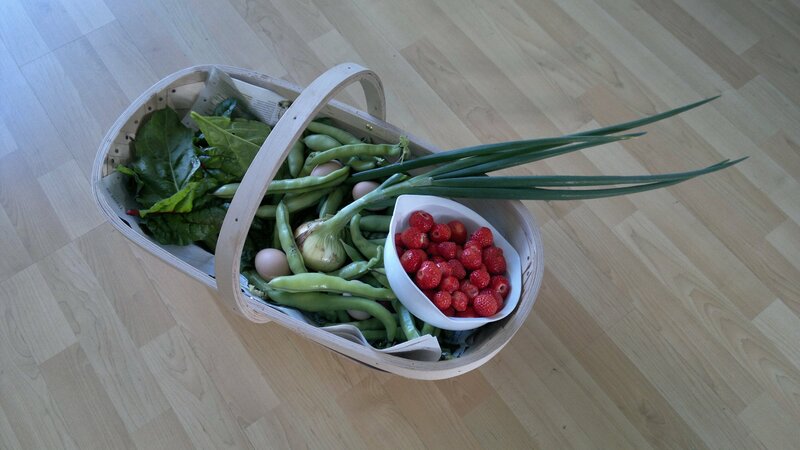 The autumn sown broad beans and peas have provided a good harvest – there are still plenty more to come, but they are about at their best right now and will soon go over. The older pods of broad beans can still be used, but the skins of the beans are best removed. This is readily achieved by blanching the podded beans in boiling water for half a minute or so and then submerging in ice water. The beans can then be popped out of their skins with ease. 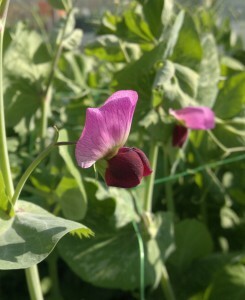 The first outdoor sowing of peas is in flower now. The mangetout types will no doubt provide the first harvest, and should be ready soon after the polytunnel crop is finished. This year we are growing the heritage mangetout variety Carouby de Mausanne. I did not realise that this variety had such attractive flowers. Indeed, it might well be worth growing just for decorative purposes, being as attractive, in my view, as any sweet pea I have seen. 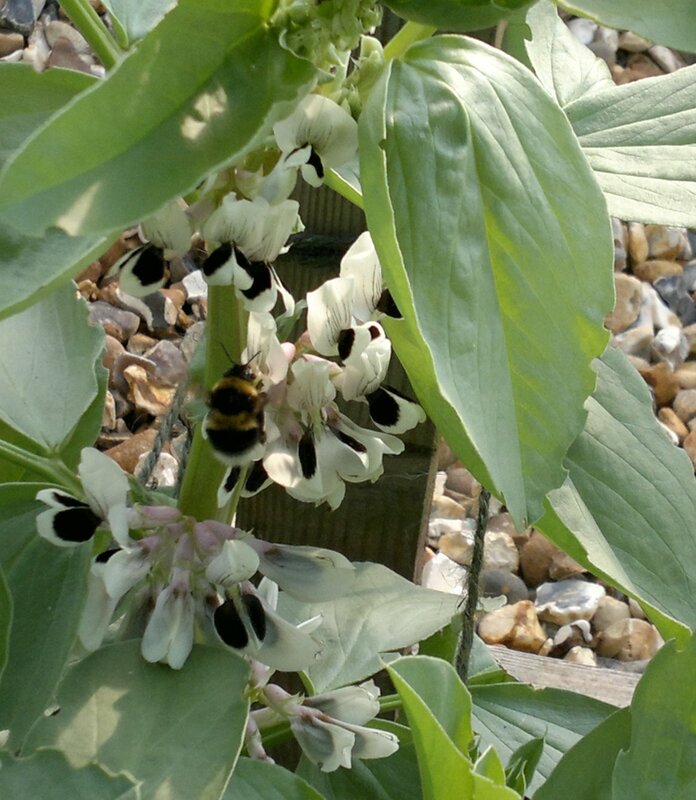 The first outdoor sowing of broad beans is loaded with flowers, and regularly attracts the attentions of the local bumblebees, which is great to see. I should have sown some dwarf french beans in the polytunnel for an early crop. Instead I have slower growing climbing beans in the tunnel, which are doing well but a long way from producing any beans, and recent sowings of dwarf beans outside, which in retrospect would have been better the other way around. We have also enjoyed some fast growing turnips and radish, which are always good for early sowings and can be relied upon to give a crop when little else is available. Spinach beet and rhubarb chard add some leafy greens to the mix. The first fruits of the year, strawberries from the glasshouses, have also started to ripen over the past week or so and are now in full flow. At the moment we have mid season Cambridge Favourite planted in the borders, although an early variety might make more use of the extra heat to give a really early harvest. However, these were bought with a couple of fruit trees to make up a minimum order value so I was not too concerned. This is still a common enough variety, often seen at the garden centre; the flavour and texture are reasonable but not outstanding, and the fruits tend to be somewhat soft, and best taken just on the point of ripeness. Having said that, they still compare favourably with supermarket offerings. Interestingly, within a bowl of fruits of similar apparent ripeness, there is a wide variation in flavour, with considerable differences in the balance of sugars and acidity, as well as the fragance and that indescribable ‘strawberryness’.